Croatia had 1,107 towns with Serb majority, and I systematically compared the situation from the 1991 census with that of 2001. From this I established that in the majority of towns with Serb majority the infrastructure has been completely destroyed. Not only have people been expelled, their property was destroyed as well... I've noted the destruction of the entire infrastructure: emergency rooms, art houses, warehouses, power stations, cemeteries... Ethnic cleansing in Croatia encompassed people, property and even real estate registries. I went further, statistically analyzing the two hundred-plus cities in Croatia, and established that some 124,000 Serbs were expelled from places where there was no fighting, and that the same destruction was applied to their property. There isn't a single village where someone hasn't been killed or disappeared. In larger cities there were concentration camps, euphemistically called "collection centers," and in many cases people died there. Statistics show that 10,000 people were expelled from their homes in Split, and 18,500 from Zagreb. At the Zagreb fairgrounds, there was a concentration camp at "Pavillion 22." Everyone pretty much knew what went on there. Some 200 people disappeared. Still, the largest number of people were killed in Sisak. Any mention of Balkans wars in the Western media includes numbers: 250,000 (the false, grossly inflated number of war deaths in Bosnia); 8000 (the purported number of Muslims slain in Srebrenica in 1995); 10,000 (the number of Albanians allegedly killed by Serb forces, "estimated" by NATO sources). There's one number that's never mentioned: 380,032. The 2001 census listed 380,032 fewer Serbs in Croatia than in 1991. As Dr. Livada's research shows, that number was brought about by actions "with intent to destroy, in whole or in part, a national, ethnical, racial or religious group, as such." Nebojsa, whay aren't you publishing these blog entries on antiwar.com - just like all other contributors? I have always wondered why western nations were so anti-Serb during the Yugoslav secessionist wars. I mean did they really do all those things just to set up bases in the Balkans? Or to make up for their transgressions in the middle-east? It seems ridiculous whatever the reasons may be. I still publish stuff on the Antiwar.com blog, but I reserve that for issues pertaining to the Empire and interventionism and such; this blog is for all and sundry. I should have linked to Serbianna's and Julia Gorin's coverage of the Thompson concert, to give this some more context, but I was in a bit of a hurry. I'll correct that soon. Whenever Reuters, or other "agencies", publish an article touching on the Kosovo misery, they consistently use 10,000 and tack it somewhere within the body of the article as though it were mandatory to do so. Not that it would have any relevance to what they were saying but it seems there is a policy to place this "fact" in order to skew even further their lopsided screeds. I've tried in vain to find a way to respond to this nonsense but it seems that they like to live in their ivory towers and haven't any desire to hear anything but themselves. Jared Israel of Emperor's Clothes called that particular practice the "obligatory bash," and there is also a Goebbelsian moniker for it. Basically, the "background paragraph" that's supposed to put the story in context is always loaded with official lies, and all stories about that country or person contain the same paragraph. For example, any mention of Serbia had to be accompanied with a note that Milosevic was on trial for war crimes. If you look carefully, you can spot the propaganda in every story. It's not a matter of "ivory towers" - it's what they exist to do. I agree with you that its what they exist to do. The fact that you have to pull hens teeth to find a way to respond to their diktats only proves that it's pure propaganda. To them its a one way street and you either shut up and get in line or get run over. I posted this to Digg, with a description comparing this to the Trail of Tears in the 19th century US. To add to that subject the is a news article here (http://www.canada.com/topics/news/world/story.html?id=dc95d713-659c-4061-bb05-618e8b2642fe&k=24011) stating that NATO was drawn in bombing serbia because serbia expelled under of thousands of albanians and aso on. 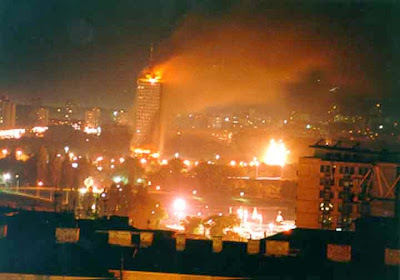 anyone with half a brain who followed that conflict from another planet would have know that it's the ramboulillet ultimatum that "allowed" nato to bomb serbia, then followed the albanian exodus but CERTAINLY not because of serb army who were almost impossible to find during the bombimg itself. how do you fight such mass brainwashing in the public.